Tag Archive | "lava flow"
Since the onset of this eruption, a total of 10 fissures have emerged, and at least 26 homes have been destroyed as of May 6, 2018. Fire/rescue responded to an 8:15 a.m. alarm Thursday (Feb 1) to the Kalapana lava viewing area in the old Royal Gardens Subdivision to rescue hikers from noxious fumes. The 61g lava flow, extending southeast from Puʻu ʻŌʻō on Kīlauea’s south flank, continues to supply lava to the ocean near Kamokuna. The western portion of the ocean entry was not active during observations yesterday, such that its span was narrowed to about 492 feet since July 29. Viewing the active breakouts requires a long (8-10 miles, round trip) and hot hike. Hawaii Volcanoes National Park is waiving their entrance fee on Monday (Aug 1) to celebrate the centennial of their establishment. As of midday Friday (July 15), the 61G lava flow front was about 730 m (0.4 miles) from the coastal emergency road and 870 m (0.5 miles) from the ocean. The leading tip of the flow was active on Friday and the area around the flow tip has widened. When mapped on Tuesday afternoon (July 5), the lava flow front had advanced nearly 0.5 miles since Monday; the flow front was about 1.1 miles from the ocean. The USGS Hawaiian Volcano Observatory (HVO) is closely tracking the Kīlauea lava flow, which is threatening residential areas in the Puna District of the island. 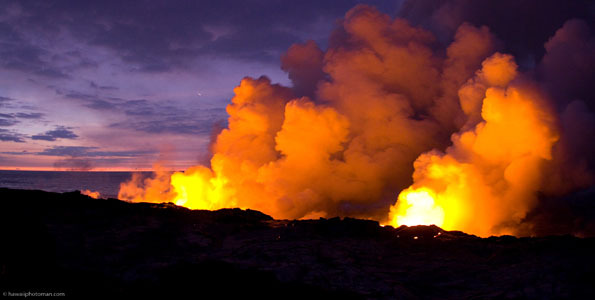 Lava flows into the Pacific Ocean at sunrise in Hawaii Volcanoes National Park.